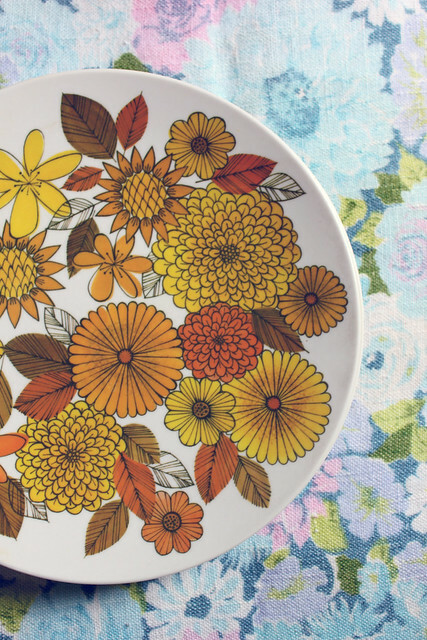 Melmac-like dishes with the most fantastic floral design. I snagged all six. A set of four dinner plates, saucers, and bowls in this lovely vintage pattern. I also picked up a couple of pant suit hangers for art prints, two vintage sheets, and a soft linen table cloth in a floral print. This little sweater was cut off at the sleeves but will look adorable over a long-sleeved onesie and paired with skinny jeans and mocs! This sweet little corduroy coat is a 3T but I couldn't leave it at the store for such a great price. I'm thinking an exchange of some colorful buttons will give it that extra pop to make it even more unique. No seriously, I am so thankful for my loyal readers and the support you've shown Smile And Wave just by checking in often. I appreciate you all, commenters and lurkers alike! This space wouldn't be the same if it weren't shared. You guys are fabulous! 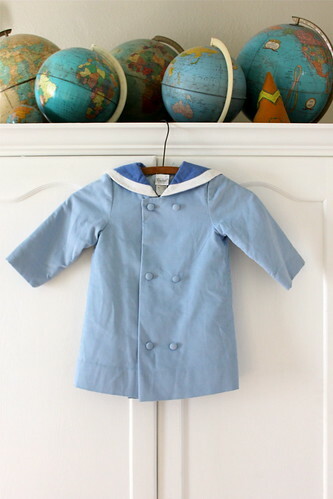 Oh my goodness, I want a blue coat like that in MY size! Maybe one in yellow, too? thaaaanks! congratulations on your 1000th post! That's so exciting! I love love love your blog. such a good idea to use pant clothes hangers to hang prints.. wow.. i should try that some time..
congrats on hitting 1000!!! epic..
Congratulations again! What an effort! Thanks, everyone! Especially Bron for de-lurking!! Congrats on your 1000th post ! I look forward to the next 1000.
of course you couldn't leave a coat like that at the store! 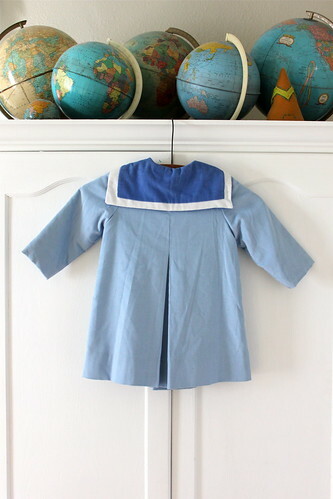 it would be super cute with some fun vintage buttons! in the color red for ruby!!!! Congratulations! :-) It'll take about ten years to post my 1000th post! Happy One Thousand'th! Congratulations on a lovely blog, I love it. 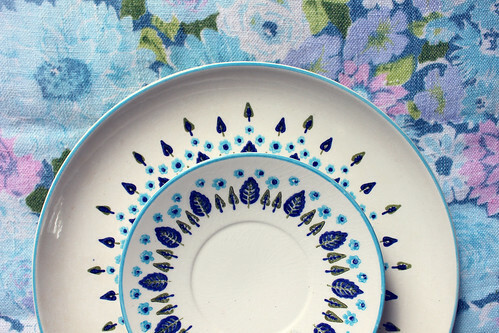 I love love love those vintage white and blue plates!! They're so gorgeous!! Congratulations on your 1000th post. And thank you for having such a lovely blog! How exciting! Congrats! And super love the dishes...and all your globes! I think I will de-lurk myself also (very funny Bron) Congrats on your 1000 post! Congratulations on your 1000th! I keep you in my reader while others may work their way in, out, and back in... and back out! 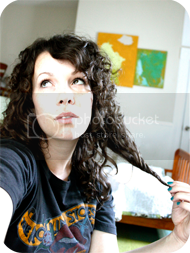 I keep you around because you are sweet and post an interesting mix of blog posts. Your posts about your adorable children are great but that's not all you share. Smile and Wave is such fun to read! Those new dishes are lovely. Love those fall plates!!! Perfect for Thanksgiving dinner:) And congrats on 1000 post! Loved your blog this whole year so far. Yay! 1000! I think I am only at 150 so I have a ways to go. :) Love stopping here on a daily basis. You are one of my favorites. Those melmac dishes are fabulous...you always find the best stuff! Happy 1000th post! 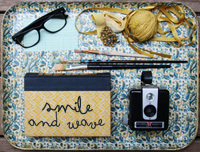 Organized or not, your blog is fantastic and is one of my favorites. congrats!! such a fun blog to read. im never bored! Congrats on the 1000 post! My parents have a HUGE set of that vintage blue flowered dish ware that we used as regular everyday plates my whole life! Funny that you found some! Congrats Rachel!!!! Love love your blog and have to admit I frequent quite often... I love to look back on the posts I missed before I found you!!!! Please keep up the great work! Wow, 1000 posts...congrats! You have an amazing blog, looking forward to the next 1000! no thank you...your blog, as well as others, keep me occupied when its slow at work. Congrats on your 1,000th post. Congratulations from Paris on your 1000th post! hahah, you are welcome! :) Congrats!! congratulations on your 1000th post! that is quite the milestone! and these vintage purchases are most definitely the loveliest. those hangers are sweet and the vintage floral sheets are soo lovely. congrats on your 1000th post!! On a side note - where do you get Ruby's skinny jeans?! hands down adorable. congrats! happy 1000th i guess i am more of a lurker than a commenter but your blog is always one of my daily reads. Congrats!! I've been following you for a while. Love your blog! I've been using Bloglines (which is going away! ), but I try to click over to give you readership numbers a boost. I'm really not sure how that all works out, but I don't want to cheat you. Hope you keep posting for a long time. Omg- those melmac plates!!!! *jealous*.. the other vintage blue and white ones I have seen at my thrift store many times and have been an idiot and passed them up. Of course, I always regret it later. I'm so envious of your finds! And I'm LOVING the plates.... I pick up the funky melamine saucers/dessert plates whenever I spy them. (10 cents each, who can pass them up?) My kids love using them for lunches, and they each have their favorite plate. Congratulations!!! I love love love the coat!!! happy 1,000!!! I so love this place, and your finds today are wonderful! 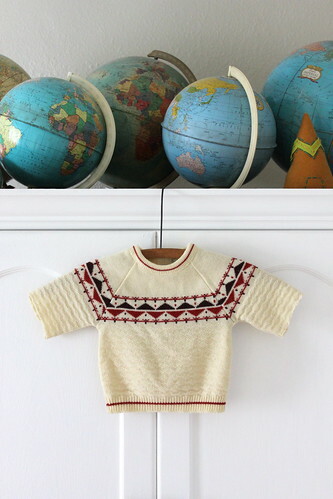 Congrats, on 1000 posts and on finding such great vintage treats :) I love reading your blog. Wow that's a lot of posts! Congrats on reaching that amazing milestone. Your vintage finds are so sweet! Congrats on the posting milestone!! I had to comment to officially not be a lurker anymore! :) I have been reading your blog pretty religiously now for about a year ever since I found Elsie's blog! I love it and am always inspired! Thank you! love the dinner dishes. i've never seen a pattern like that. love one of a kind stuff. that coat is to die for!!! + i have a girl one month younger than yours and you were a great referent during my pregnancy. Oh my goodness! What a surprise to see on my reader list... My family has the same exact plate set (the blue one). Or at least they did, but I know for sure my parents still have at least 2 of the saucers. Those were always my favorite saucers to use! Amazing finds! You are seriously a pro at finding the greatest vintage items. Love it! And congratulations on 1,000 blog posts! I am SO happy that I found your blog. It's wonderful. :) Here is to thousands more! ackk!! I love the melmac!! I go to jeff city all the time and scoop up whatever I can!! yay for 1000. way to go rach. Yay! Congratulations, what an amazing accomplishment. 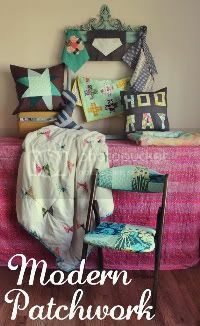 I have enjoyed you blog for some time now, and you have such a knack for vintage treasures! congrats on 1,000 posts!!! and thanks for showing that crafty girls can grow up and become crafty mommas. My grandparents have something very similar to the orange floral print on the plates. I love them! Congrats on hitting 1000th post! That's awesome!! Congrats on your 1000 post! I've always wanted to go back through your archives, I didn't realize there would be SO many posts to read, LOL. I did a lot of thrifting this week too. Our little downtown is awesome I've discovered. My grandma had that same pattern of dishes as the blue flowered you found. My mom and I saw it in several stores here in town this week. Congrats on your 1000th post! I love your blog & stop by almost daily. Thank you for all the inspiration & peeks into your daily life. I have always really loved your blog, the voice you have, the beautiful and honest things you share. sometimes I feel like the word "inspiring" is overused, but there is something about your blog that makes me excited about life and making things. so thank you! Congrats on the 1000th post! 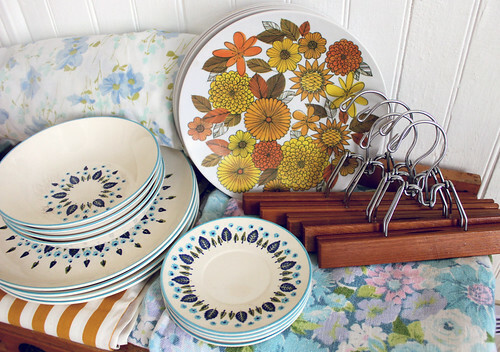 And i totally have dishes in the vintage blue pattern, too. I love the gold flower plates.